Thinking the rule of thirds. Rule of thirds. Today is deadline day for Shelley’s first assignment in our photography class, and I’m not really happy with anything I’ve shot so far. So while I’m editing the April issue of the U.S. Hunter Jumper Association’s magazine In Stride, I glance down from my desk and see Peppermint lying in a sunbeam. The shadow bisects her body, creating very interesting angles. So I quietly reach across my desk and grab a camera. Click. She looks up. Click. She gives me the evil eye. I woke her up from her nap, and she wasn’t happy. 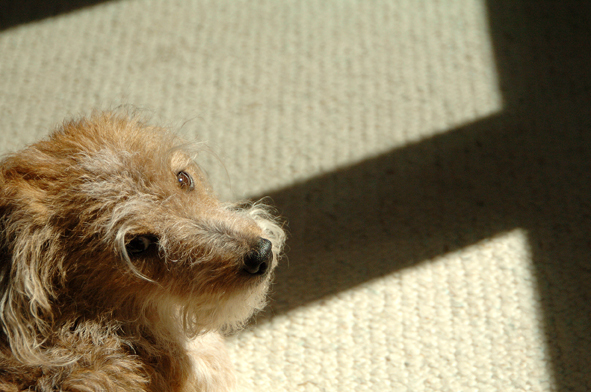 After sorting through a dozen photos I took of her in the sunbeam, this is my favorite. And, as it so happens, it works into today’s rule of thirds assignment. As for Peppermint, she’s fine with the interruption. As a reward, I turned on the gas fireplace in the family room, and she’s much happier napping on her dog bed without the annoying clink of computer keys. Love the Jack Russell photos! They are so photogenic! Excellent job!